TAIPEI, Taiwan (AP) — Taiwan's aviation authority say at least two people have been killed when a commercial flight with 58 people aboard clipped a bridge shortly after takeoff and crashed into a river in the island's capital of Taipei. Aviation authority director Lin Chi-ming told a news conference that two people were killed. The country's Central News Agency said three people were killed. 'Surely not'..... I nearly replied. Unbelievable footage almost seems cgi, it looks like the plane clipped a tuk-tuk on its way down, amazing how close it came from crashing directly into the bridge evading what would have been an even worse disaster. Pretty surreal when your wife flew out of that exact same airport on the same day!! It's difficult to be sure, but from one picture it looks like the "port" engine propeller is "feathered". (stopped and leading edge turned forward) This is done to reduce drag in the event of an engine failure. Otherwise, it's like having a flat, 9 foot steel plate out there, with a windmilling prop. It looks as if the operating engine is pushing the airplane into the "dead" side, indicating control problems and may be caused by too low an airspeed. I've read reports where the pilot had issued "mayday" calls expressing an engine failure. The engines on that airplane are extremely reliable. And technically, the airplane should be able to fly with only one engine...even with a failure at the worst possible time, just at or before liftoff. As usual, there's probably more than one factor involved in this accident. R.I.P. to all souls lost. Better quality footage from a bit further back. Crazy stuff! I cant see if its feathered or not.. But its obvious he was going into stall and then (I think its called) tip stall.. It does looked like the left wing stalled inducing that rapid roll. Low level isolated turbulence ? Both people in the taxi it hit walked away, that will be some story to tell. I think there's a major fcuk-up going to be found here. Maybe shut down the wrong engine? Last edited by Pablo; 6th February 2015 at 21:50. Good bit of advertising for VW. Safety so good it can withstand a plane crashing into it. On Feb 6th 2015 Taiwan's ASC reported that the investigation so far determined from flight data and cockpit voice recorders: the aircraft received takeoff clearance at 10:51L, in the initial climb the aircraft was handed off to departure at 10:52:33L. At 10:52:38L at about 1200 feet MSL, 37 seconds after becoming airborne, a master warning activated related to the failure of the right hand engine, at 10:52:43L the left hand engine was throttled back and at 10:53:00L the crew began to discuss engine #1 had stalled. At 10:53:06L the right hand engine (engine #2) auto-feathered. At 10:53:12L a first stall warning occured and ceased at 10:53:18L. At 10:53:19L the crew discussed that engine #1 had already feathered, the fuel supply had already been cut to the engine and decided to attempt a restart of engine #1. Two seconds later another stall warning activated. At 10:53:34L the crew radioed "Mayday! Mayday! Engine flame out! ", multiple attempts to restart the engines followed to no avail. At 10:54:34L a second master warning activated, 0.4 seconds later both recorders stopped recording. Reading that it sounds like after the RH engine failed and they throttled back the LH engine, it stalled, and by then both had now feathered. They tried to restart LH engine but couldn't. So not sure they shut down the wrong engine? Sounds like they were trying to compensate for the RH engine failure and in doing so screwed the LH engine somehow causing it to stall and feather. The fuel seems to also get cut off to LH engine, then seconds before it resumes and potentially they engine restarted, but too late? "On Feb 6th 2015 Taiwan's ASC reported that the investigation so far determined from flight data and cockpit voice recorders: the aircraft received takeoff clearance at 10:51L, in the initial climb the aircraft was handed off to departure at 10:52:33L. At 10:52:38L at about 1200 feet MSL, 37 seconds after becoming airborne, a master warning activated related to the failure of the right hand engine, at 10:52:43L the left hand engine was throttled back and at 10:53:00L the crew began to discuss engine #1 had stalled. At 10:53:06L the right hand engine (engine #2) auto-feathered. At 10:53:12L a first stall warning occurred and ceased at 10:53:18L. At 10:53:19L the crew discussed that engine #1 had already feathered, the fuel supply had already been cut to the engine and decided to attempt a restart of engine #1." It sure sounds like they shutdown the wrong engine to me? I mean...a warning light activated relating to the failure of the RIGHT engine, and 6 seconds later someone retarded the LEFT engine throttle? Then quickly followed by a discussion that the LEFT engine (#1) had stalled and subsequently feathered, with the fuel supply cut off etc (shutdown). And then the RIGHT engine "auto feathers". All this within about 30 seconds of the initial warning? Looks like hands were flying around the cockpit at record pace, and brains were slow and frozen! At an altitude of 1200 feet, NOTHING should be happening that fast, with an engine failure! I don't like or trust these "auto feather" systems that are currently the wave of aircraft engineers. Nor do I like or trust the "rudder enhancements" that lately are also the new wave and usually accompany the auto feather systems. These enhancements automatically apply rudder in the event of an engine failure! To me they're just more things that can go wrong with a loose, spurious electron or two. As a pilot, I've experienced a couple of instances of these marvelous electronic "automatic" features going awry. The engineers continue to try and fly the airplanes from their design desks...ala' "airbus"! This, while I firmly believe that the pilots should have complete unfettered management of flight control input (rudder) and when a propeller needs to be feathered FFS! The pilots in this instance were obviously confused by the "bells and whistles" and just sat there confused, as the automatic systems may have prevented the normal informational input that a pilot should receive. If your FLYING the airplane and the right engine fails, the airplane begins to yaw to the right. The pilot corrects this by applying rudder to the left to counteract the asymmetry of thrust. The old hangar talk adage about an engine failure was "live foot = live engine, and dead foot = dead engine". And "look down to see which knee is bouncing (nervousness), to see which engine is running", is so true. These are physical, mental and visual cues that confirm what the problem is and what necessary actions should be...and with auto feathering and auto rudder input, they're largely taken away. The 3 basic steps of handling an engine failure on a multi-engine airplane, are to "Determine, Feather, and Shutdown". Firstly, fly and "right" the airplane. 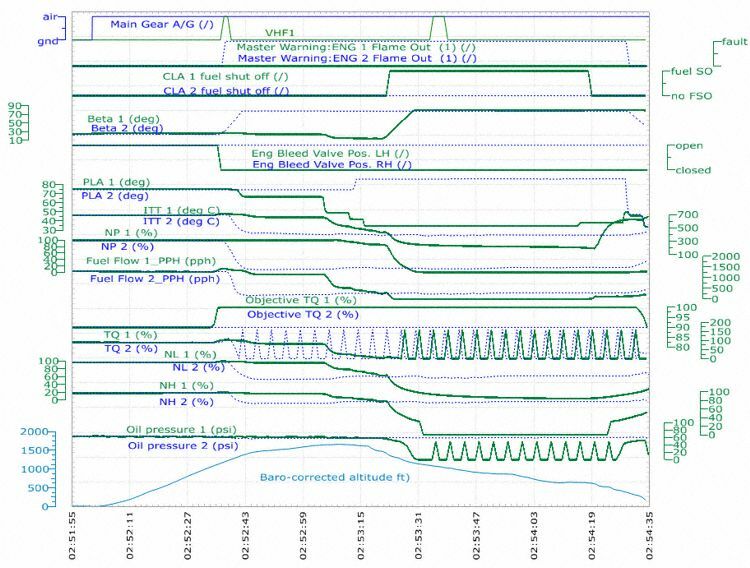 Then DETERMINE which engine has failed by retarding the throttle and observing and changes in aircraft attitude or yaw (no changes, that's the dead engine). After DETERMINING for sure which engine is faulty, you then FEATHER the propeller on the faulty engine, to reduce drag. Finally (and lastly) after the airplane is stabilized, you SHUTDOWN the faulty engine, by securing the fuel, bleed air, hydraulic, and electrical components or whatever, for that particular engine and model...of course, using a checklist. Perhaps these pilots were attempting to DETERMINE which engine was failed, by retarding the left engine throttle? But if the rudder was acting in automatic mode and they weren't getting any physical, mental, or visual input...this would add to the confusion. I understand your desire, as a pilot, to have 'control' of the system.. But really, in this case it seems like pilot error, maybe less not more would have actually prevented this one..
Or at least an audible warning "NOT THAT ONE"
(Reuters) - The Taiwan government ordered all airlines review their safety protocols on Wednesday after nearly half of the pilots trained to fly TransAsia's ATR twin-engined aircraft were suspended following last week's fatal crash in the capital. "The result is not acceptable for us," TransAsia chief executive Peter Chen told a news conference. "We will definitely strengthen their training. "The lunar Chinese new year holiday is coming... We'll ask every local airline to check their flight safety," Chen Jian-Yu, the transportation and communications minister, told reporters after the TransAsia test results were made public. "Some of us have stayed up all night to prepare for the tests. The result will affect our career developments significantly," said the pilot, declining to be identified due to the sensitivity of the issue. "Those who failed will be suspended for one month. They will be given another month for preparation. If they fail again, they will be fired," the pilot told Reuters. TransAsia has canceled at least 142 flights since the crash.